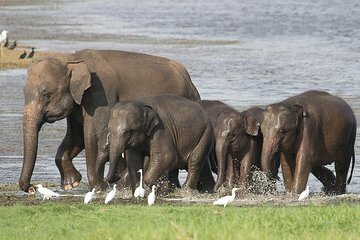 Watch for Sri Lankan elephants on a private 3-hour safari in Hurula Eco Park, a reserve best known for attracting these endangered giants. Roam the grasslands and forest by 4x4 in search of the herds that migrate here regularly, making sightings likely. Observe the elephants grazing or bathing — both more frequent during the afternoons — and watch for other species and birds. Choose a morning or afternoon safari, with entrance fees at own expense. Book a morning or afternoon safari and meet your personal driver-guide at Hurulu Eco Park gate. Head inside (own expense), and board your private 4x4 for your safari. Part of the Biosphere Reserve that is Hurulu Forest Reserve, Hurulu Eco Park boasts an average temperature of 80-82 degrees Fahrenheit (27-28 degrees Celsius), and consists of dense forest, brush, and grasslands. The terrain attracts an array of wildlife, including the threatened rusty-spotted cat, Indian star tortoise, and rare Sri Lankan junglefowl, but it’s best known for its endangered Sri Lankan elephants. The elephants are regular visitors as they migrate between the park and its neighboring reserves of Kaudulla and Minneriya, so there’s a high possibility of seeing these majestic beasts. Trundle through the grasslands and with luck, observe the herds that can number 30 or more. Sightings are more likely during afternoons, when the elephants gather to feed and bathe. Watch for the park’s other, more elusive species, and birds like parrots and bee-eaters, and learn about the animals and flora in the park from your guide along the way. Your 3-hour safari concludes back at the start point.